A forum to discuss and post updates on the Gaslight Village project. nice pics hood. 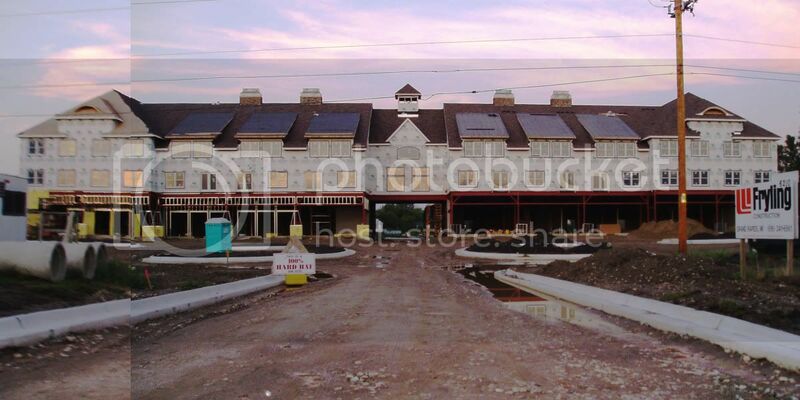 it looks like this phase of gaslight village is pretty far along. I would love to see a siteplan of the development. It's actually supposed to be done by the end of the month, that may be a bit doubtful, but I would say it should be done by next month almost definately. One thing about it is that it looks a little bit bigger than I had pictured it being, it actually stands out quite a bit. I pulled in to Gaslight Village today. The progress is pretty near completion, and there is a banner that says "Look out for our grand opening". I like the look of the building, it reminds me of a ski resort lodge for some reason. Driving by it every day, it is still not complete. They blew it by mailing out hundreds of invitations for the grand opening, and then had to cancel it. Occasionally I see Open Today signs, but it doesn't appear to be completed as of yet. They have definately taking their time on this one. I was by it probably 3 weeks ago or more and it appeared complete from the outside. Could someone maybe post an updated picture of this? I haven't been by it in awhile. I really do have to go and do another phototour, both of downtown and the northern tier. I've really been slacking, if I can motivate myself I'll get out tomorrow or Sunday. I will get a picture today of this deserted looking development. Grand Opening banners out front, there has not been any vehicles in the parking lot for weeks, other than an optimistic Realtor who plants their open house arrows out occasionally. Very disappointing. Any photos you wish of the northern tier, please ask, I work in the center of it on Chandler Rd. I just don't know how to add photos to this website. Help? You can add upload them on www.flickr.com and post the link on this site. I am curious to see new pictures of the development.